Both structural glasses and disordered crystals are known to exhibit anomalous thermal, vibrational, and acoustic properties at low temperatures or low energies, what is still a matter of lively debate. To shed light on this issue, we studied the halomethane family CBrnCl4-n (n = 0, 1, 2) at low temperature where, despite being perfectly translationally ordered stable monoclinic crystals, glassy dynamical features had been reported from experiments and molecular dynamics simulations. For n = 1, 2 dynamic disorder originates by the random occupancy of the same lattice sites by either Cl or Br atoms, but not for the ideal reference case of CCl4. Measurements of the low-temperature specific heat (Cp) for all these materials are here reported, which provide evidence of the presence of a broad peak in Debye-reduced Cp(T )/T 3 and in the reduced density of states (g(¿)/¿2) determined by means of neutron spectroscopy, as well as a linear term in Cp usually ascribed in glasses to two-level systems in addition to the cubic term expected for a fully ordered crystal. Being CCl4 a fully ordered crystal, we also performed density functional theory (DFT) calculations, which provide unprecedented detailed information about the microscopic nature of vibrations responsible for that broad peak, much alike the “’boson peak” of glasses, finding it to essentially arise from a piling up (at around 3–4 meV) of low-energy optical modes together with acoustic modes near the Brillouin-zone limits. Moratalla, M. [et al.]. 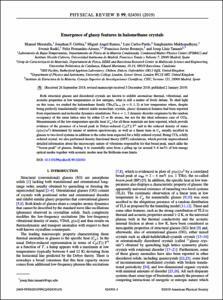 Emergence of glassy features in halomethane crystals. "Physical review B", 2 Gener 2019, vol. 99, p. 024301-1-024301-9.